Actually, the Stagirite doesn't agree with him because--as he points out--something gets lost in changes, but something else remains, i. It is interesting, in the first place, to take a look at the way Schelling pictures the Stagirite. However, Thomas observes that what the Stagirite says about acquiring science is more in conformity with Plato's theory (ideas are impressed in the intellect without any change), but that his own view in the De anima III is different: we acquire science by abstraction. Still, the intellect is for the Stagirite the function which presides over the recognition of the inherence of the universal in the particular. The Stagirite remarks that "as a rule the future resembles the past," (60) presumably--given Aristotle's tenets on the grounds of regularities (61)--because they exhibit a similar causal configuration. Thomas' method of commenting was considered highly original in his day because of the clarity of his expose, the depth of his understanding, his command of the entire thought of the Stagirite, his knowledge of the positions of the different philosophers, his efforts to secure the best translations available, and above all, his meticulous explanations of every single sentence of the text. Verbeke highlights the aspects in which Avicenna is faithful to the Stagirite, and in what fashion he expands on the Philosopher's thought, making an original contribution to the field. 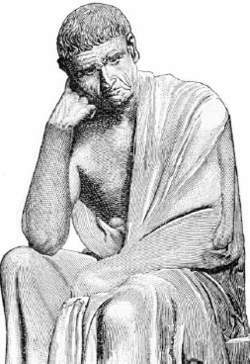 He shows, in his discussion of four conditions of moral failure not acknowledged by the Stagirite, how Aristotle gives no thought to the tragic possibility of unrewarded good acts: there may be goods for which there are no definite practices (such as "being a good parent"); internal ends might not lead adequately to the external end at which they aim; individual good acts might bring about bad results for society; and virtues that bring the individual soul into good condition could conflict with those that bring good results to the community. Several times in the Metaphysics, the Stagirite uses sight, thought (or contemplation: [GREEK TEXT NOT REPRODUCIBLE IN ASCII], and happiness as exemplary [GREEK TEXT NOT REPRODUCIBLE IN ASCII]. Aristotle's [GREEK TEXT NOT REPRODUCIBLE IN ASCII]: a true grasp of ends as well as means? The extant Corpus aristotelicum contains the text of many of his lectures--not his dialogues destined to a larger public--and the Stagirite coined a special terminology to express what the analysis of reality showed him. It was thus a sound insight into the thought framework of the great Stagirite that led the anti-Aristotelian writers of the Renaissance, and later preeminently Descartes and Spinoza, to attack the Platonic/Aristotelian conception of the embodiment of value in nature and the modern logical positivist opponents of metaphysics to attach the stigma of illegitimacy to all evaluative disciplines. The Stagirite presented them to deceive, contriving faulty and inadequate arguments (p.